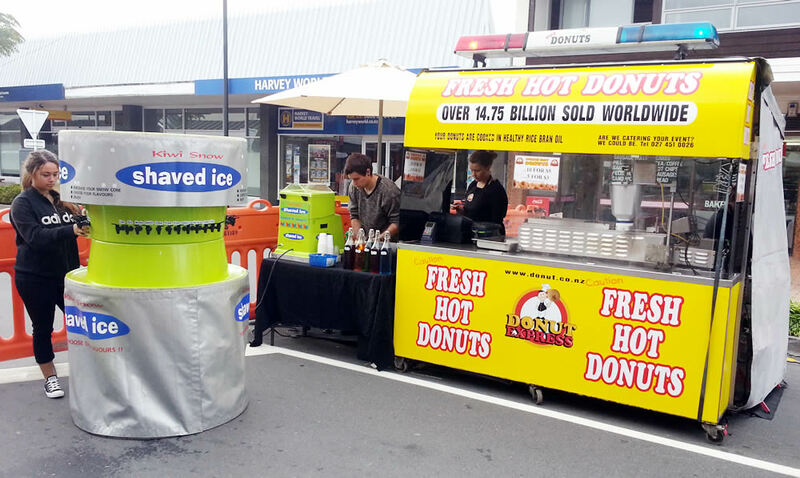 The Donut Experts at Donut Express are mobile catering experts that specialise in Fresh Hot Donuts that are made in an exhibition style at major events. Fresh Hot Donuts, Cold Shaved Ice, Popcorn or Candy Floss. The Donut Express team can help you out. Please contact our team to discuss your individual requirements. Our team specialise in public events from 2,000 to 30,000+ hungry people. 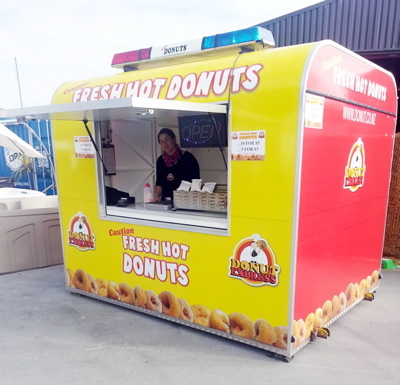 Donut Express have fed the hungry hordes at the Big Day Out, Wellington International Sevens, Auckland 9’s, Parachute, WOMAD, All Whites, All Blacks, and many others. Last year alone we had our Donut Experts at 472 events. We offer Donut Carts and Caravans plus Shaved Ice, popcorn and Candy Floss to attend ‘Private Functions’. These Private Functions include Corporate Functions as well as Private Gatherings such as birthday parties, weddings and reunions. Use our Make a Booking form, to book online. Donut Express custom-made Donut Carts or Donut Caravans can come along to your event, just give us a ring on 0800 132 533 to have a chat. The business is a family owned national business that sold 2.12 million Fresh Hot Donuts last year. Donut Express donuts are made from our special blend of quality ingredients, designed to be soft and delicious. Try them now!! Your donuts are cooked in 100% Rice Bran oil as the healthy option. All you need to cool down on a hot day is a cup of filtered, shaved ice. 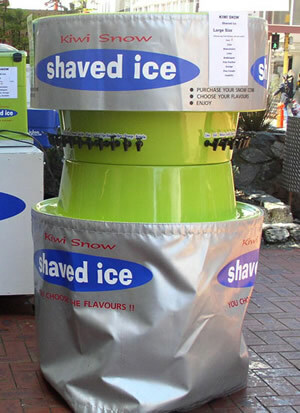 Then head over to our ‘Flavour Station’ and choose from over 36 flavours to make your shaved ice delicious. Munch away slowly as you enjoy the sunshine! Shaved Ice is a popular classic that kids love...both young and old! Our custom made flavour stations include popular favourites such as Cola, Watermelon and Orange. But it doesn't end there! The more adventurous can try out some more unusual flavours such as Tigers Blood, Godzilla and Slime! Did you know?? It takes more than half an hour to consume one shaved ice! After much deliberation and taste testing we are really excited to launch our Gluten Free Fresh Hot Donuts at The Feildays being held at Mystery Creek Events Centre on 10-13 June 2015. Please visit Food Court H to purchase your Fresh Hot Donuts made with our NEW Gluten Free Recipe! Please note that Food Courts B, G1, K, M and N will have our vanilla Fresh Hot Donuts while Food Court C has the new Chocolate Fresh Hot Donuts! These are a MUST HAVE if you LOVER chocolate! Fresh Candy Floss made at your event in the colour of your choice. Wow! We know that fundraising is important. We kept this in mind as we created our special offer for local schools that fundraise through annual fairs and galas. The offer we have for you has three major components that ensure you receive a maximum return for your efforts. If you hold a gala or fair annually (or bi-annually) then please make contact with Sally from our School Fundraising Team to discuss your fundraising wish list. References and figures are available.